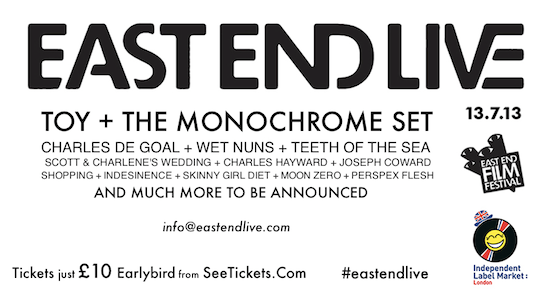 East End Live have confirmed more acts for the July 13 event. Doom rockers Bong along with Blurt, Filthy Boy, Neil's Children, Ashkelon and Niqab, Edgar Smith, Limb, Good Throb and Weird Menace have all been added to the bill, and there have been further confirmed details for the run of pre-parties leading up to the one-dayer. Douglas Hart will be launching his single at The Griffin on June 5 - have a watch of Hart being interviewed by EEL below - with Purson and Joseph Coward playing Vibe Bar on May 21 and Charles Hayward, supported by new wave newcomers Telegram, due for a set at The Old Blue Last on June 21.